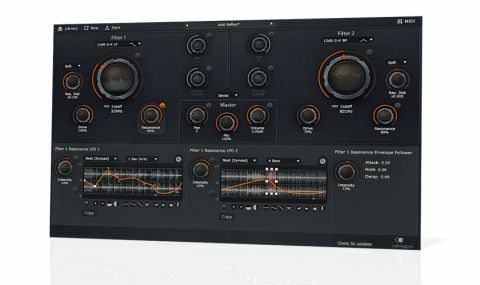 FilterShaper 3 makes up for its standard- sounding filters with its amazing customisable LFOs and quick workflow. Easy-to-navigate GUI. Oscilloscope feedback on curve editors. Deep LFO control. Huge creative potential. Ever-growing library of presets. Sallen-Key filter mode is a cool addition. In this, its third incarnation, the name FilterShaper almost feels like a misnomer for Cableguys' sound-shaping plugin (VST/AU). Sure, with its prominent pair of identical, multimode filters - which can run parallel or in series - it's certainly capable of all the frequency boosting and attenuation that one would expect of a plugin with 'filter' in its name. But to think of it as "just a filter" would be to miss the point. "To think of it as "just a filter" would be to miss the point. In reality, FilterShaper 3 is all about modulation"
In reality, FilterShaper 3 is all about modulation. The plugin features individual modulation sections for each of its main controls - Cutoff, Resonance, Pan and Volume for each filter, as well as master Pan and Volume - each packing in a pair of LFOs and a basic envelope follower. Each LFO is fully editable, with a graphical editor enabling complex (or simple) waveshapes to be drawn. Deeper still, the Intensity and Rate controls for each LFO also have their own modulation sections. It all adds up to a bonkers frequency-sculpting plugin that can achieve mind-bogglingly intricate modulation. Bearing that in mind, it's a big credit to Cableguys that, thanks to its completely redesigned UI, FilterShaper 3 manages to make all of this simple and approachable. Where the previous version relied on a fiddly, occasionally confusing modulation matrix for routing LFOs, v3 successfully streamlines the whole process. Each modulatable parameter has a small circular button to its right that, when clicked, brings up the corresponding modulation section in the lower part of the interface. Handy labeling and highlighting of controls make it easy to keep track of what's being edited at any point, while the ability to copy waveshapes provides a shortcut for duplicating modulation routings. The design of FilterShaper 3's wave editors is quite brilliant. It features buttons for quickly setting a variety of standard waveshapes, which are easily tweakable by placing and moving any number of breakpoints. Curves can be flipped, shifted and softened or sharpened using the controls, and the editor can be expanded to fill the whole interface for more detailed tweaking. "The editor's killer feature is the oscilloscope- style waveform that appears behind the curves"
But the editor's killer feature is the oscilloscope- style waveform that appears behind the curves, showing the plugin's audio input overlaid with its output. This makes it easy to keep track of the effect of your curve on the source signal - particularly handy for unsynced LFOs or unconventional time signatures. The filters themselves are good enough for everyday use. The new Sallen-Key mode is capable of producing some lovely tones too, and the addition of Resonance Distortion and Drive controls adds considerably to their flexibility compared to version 2. They react with swiftness to the fastest modulation you can throw at them, though they do lack a little in terms of warmth and character compared to some other dedicated filter plugins - stripped of all their modulation features, they wouldn't replace our current go-to filters any time soon. Still, that doesn't detract from FilterShaper 3's massive potential as a creative sound design tool. It's fantastic for adding movement to music - we stumbled upon awesome sound after awesome sound playing around with percussion loops, shaping background atmospherics and working up evolving pads. Anyone with a thirst for creative modulation needs to try it.